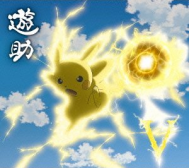 "V (Volt)" (V(ボルト)) is the first opening theme to Pocket Monsters XY. It is sung by Yuusuke. And the yellow flowers bloom.